Offering up to 32 motion axes, RMC200 Closed-Loop Electro-Hydraulic Motion Controller minimizes operation time, and delivers flexibility with programmable “Feature Key”, which enables number of control loops as needed by operator. Including RMCTools software, graphical programming interface along with Tuning Wizard to automate the process of setting control loop gains. RMC200 boasts of built-in support for controlling pressure as well as acceleration. With the needs of multi-axis forest products manufacturing equipment in mind, Delta Computer Systems Inc. of Battle Ground, Washington (deltamotion.com) announces the new RMC200 closed-loop electro-hydraulic motion controller. RMC200 extends the capabilities of previous generations of RMC motion controllers with regard to the number of axes which may be controlled and synchronized simultaneously by a single unit, making the Delta RMC200 the most capable electro-hydraulic motion controller offered to industry. “Our customers love the capabilities and ease-of-use of our motion controllers, but increasingly need more axes than we have offered in one controller,” said Steve Nylund, Delta Computer Systems CEO. “The new RMC200 removes the 8-axis limit of our RMC150 controller, and offers ample processing power for future capabilities as well. To make it easy for our existing customers to use the new controller, the RMC200 controllers use Delta’s field-proven RMCTools software for setup, tuning, programming and diagnostics.” RMCTools shortens application development and deployment times with a graphical programming interface, a powerful motion plotting tool, and a Tuning Wizard that automates the process of setting control loop gains. With the capacity to handle closed-loop control of up to 32 motion axes, a single RMC200 can manage the motion of a complete forest products processing production line. As with the other Delta controllers—RMC75 (which can control 1 or 2 axes) and RMC150 (which can control up to 8 axes)—the RMC200 has special capabilities for synchronizing the motion of multiple axes, enabling the construction of machines with scalable performance and quick production changeovers. Also like Delta’s other controllers, RMC200 provides built-in support for controlling pressure/force/torque as well as position/velocity/acceleration. The controller can transition smoothly between these control modes, enabling smooth, reliable motion. Through use of a programmable “Feature Key,” the RMC200 will enable only the number of control loops that a customer’s application needs, and hence Delta is able to deliver flexibility and charge for the exact functionality that is required, saving customers money. Other physical enhancements include a display screen on the CPU, I/O modules with push-in wire connectors (see Figure 2), and fully-encased, user-installable modules that “rock-in” to provide power-sequencing capability. 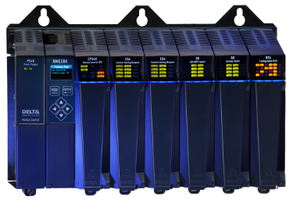 The unit’s modular expandability makes RMC200 virtually “future-proof,” supporting expanded control and I/O interfacing compatibility as new modules are developed ensuring that it will continue to be the most capable electro-hydraulic motion controller offered to industry. For more than 34 years, Delta has been a supplier of motion controllers and other industrial products that enable OEMs and integrators to build better machines and get to market quickly. Delta's RMC Motion Controllers are used for hydraulic, pneumatic and electric closed-loop control in a wide array of single and multi-axis control and testing applications. For more information contact Bill Savela, Delta Computer Systems, Inc., at 360-254-8688, or email technicalsales@deltamotion.com.